PHUKET: Despite a massive campaign by Thai Rak Thai (TRT) to convince voters to back the ruling party, and despite surveys showing that Prime Minister Thaksin Shinawatra’s popularity is at unprecedented levels, Phuket yesterday reinstalled its two Democrat MPs. Indeed, Phuket voters made it quite plain that they are not ready for TRT MPs, by handing the two Democrats hefty victories. 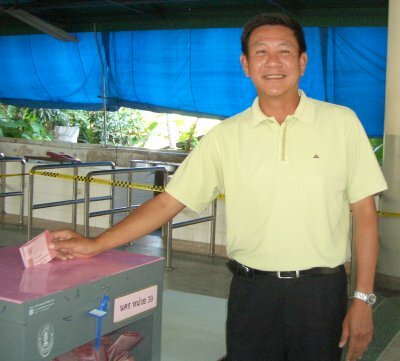 In District 1 (Phuket City and immediate area) Democrat Suwit Sa-Ngiamkul received nearly twice as many votes as his Thai Rak Thai rival, Dr Sriyada Palimapan. Initial results show that K. Suwit polled 45,111 votes, as against 23,503 amassed by Dr Sriyada. A total of 3,002 papers were spoiled, while 2,743 electors marked their papers to show that they did not want to vote for either District 1 candidate. Turnout was a high 80.49%, with 74,359 of the 92,388 registered voters making their mark. Turnout in District 2, which covers the rest of Phuket, was slightly lower, at about 77%, but again the voters handed the Democrats a convincing win, with incumbent Chalermluk Kebsub receiving 43,295 votes compared with 27,222 for TRT candidate Wisut Santikul. There were 4,360 spoiled ballots, and 4,175 voters indicated that they did not favor either candidate. A total of 79,052 people voted in District 2, from an electorate of 102,153. Results are still subject to confirmation.